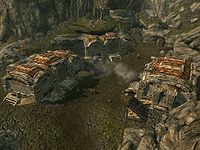 Left Hand Mine is an iron mine located in the Reach, directly southeast of Markarth. Five iron ore veins are found within the mine. Skaggi Scar-Face will buy iron ore from you.